It Works :"Was sceptical about this product but it worked fine on my Ragdoll's thick coat. My cat loves being groomed and as this product is made of soft rubber, there is no sharpness." 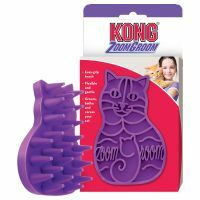 Massage Brush Zoom Groom from KONG will massage your cat's skin and gently clean its coat. The shape of the brush makes it especially easy to brush your cat. The soft rubber knobs optimally free fur from dead hair and dust. Most cats will love this massage! Was sceptical about this product but it worked fine on my Ragdoll's thick coat. 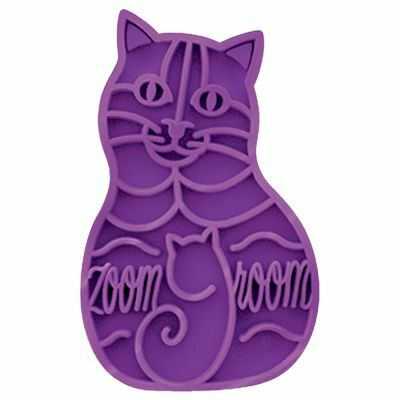 My cat loves being groomed and as this product is made of soft rubber, there is no sharpness. Yasmine hated being groomed but gradually she became used to this and now loves it. Picks up hair and massages. Moulting season a pain no more. Pull hair off and wash under tap. For hair removal I use long tooth side but I use other side for massage. Soft on the skin unlike wire brushes and durable. It works but the cats hate it! It removes loads of hair (and will also cover yourself and any furniture, so create a space or groom outside for least amounts of hassle). However, my two short haired mogs run away from it and one actively tries to bite it - not keen at all, despite loving normal strokes and scratches. So yes it works, but I only traumatise the cats about once a week as they dislike it so much! Big hit with heavily shedding floofball!! I previously used a germinate, but found this too harsh on my kittens. My adults males love the ferminator though. My sister recommended this. So I purchased. Wish I hadn't I can't believe the excellent reviews on here for this product. It fails to collect the hair, so you have so many hairs flying through the air, on yourself and on your kitty. Creates so much mess you are unable to use indoors. I can't use this, waste of money for me. Am about to order more. My cat can't get enough of it. Even lies on his back, legs akimbo and head right back in my hand, wanting me to do his whole stomach and throat area. He cries to me until I succumb and spend ten minutes grooming him every night and morning! I have worn down the "bristles" on two zoom grooms, but well worth it as apart from the joy it brings him, it really does remove loose fur extremely well. Only word of caution is to comb your cat after to remove stray hairs. Bit awkward to hold, but effective. I didn't get the change to try this too much as my cat was clear about not liking it. For the little I could use it, it worked well. It's a bit clonky to use, whike it's cute to shape it like a cat, it makes it a bit awkward to hold. and ran away. my kitten is very fussy! This lifted and loosened hair very effectively. The instructions to groom gently in a circular manner are important. The shedded hair will accumulate both on the brush and on the cat - use an old comb, or the reverse of the Kong to remove the klingon debis from the cat. As an extra bonus, it sweeps up dust/pet hair from carpets like a dream, great for carpet edges, just use the reverse (flat) side. 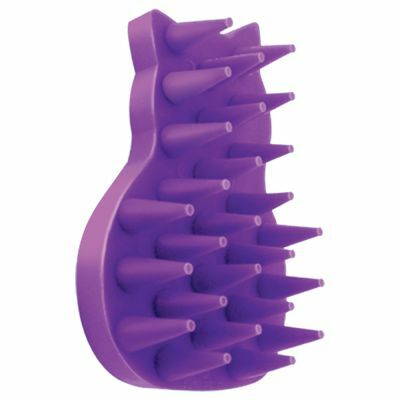 This collects fur all right, and can be used to brush down yourself. Unfortunately my cat hates being touched with it, but I think that's down to her, not the brush in question. This product was recommended by our vet for our ragdolls. Both ragdolls are happy to be brushed using this and start purring as soon as we start grooming them. Note the instructions to gently brush in a CIRCULAR motion as this way is very effective at lifting loose hair. I found using the brush this way was very effective, almost too good as some loose hair can remain on the pet so it needs removing before it transfers to elsewhere. I also found it easiest to remove the hair from the brush when there was plenty of hair on the brush. - An aptly named product that is extremely good. I bought this for my 6 cats and all love it, before I had it every day there would be fur all over the wooden stairs, so much malting.Since using it there is hardly any, even though they are short hair, 2 of the cats are quite bushy and their fur is much more to malt, so this is and excellent brush. They loved to be brush with this. It is flexible, ,soft and gets rid of excess fur very easily. The fur is easy to remove from the brush with your hand as well. A good purchase. My cat always hated being groomed until I got the Kong. Now I just show it to him and he comes running from wherever he is and falls over on his back waiting to be groomed. He just can't get enough of it. I do comb him after finishing with the Kong as a lost of loose hair lies all over him until removed with a fine comb. He absolutely adores it and it stops the dreaded hairballs. Don't bother with other brushes, because this one's rubber fingers get all the dead hair out, and if used daily, will keep your cat furball free, and it's fur will be beautifully smooth and shiny. No more fur on future or clothes!